National Invasive Species Awareness Week is Feb. 24 -March 2. Informational and hands-on learning events open to all are scheduled every day. Aggressive non-native species threaten ecosystems in most every park, but you can make a difference. Join volunteers of the JRPS Invasive Management Task Force and Richmond Tree Stewards to learn how to “Free a Tree” and identify the plants you don’t want in your neighborhood. 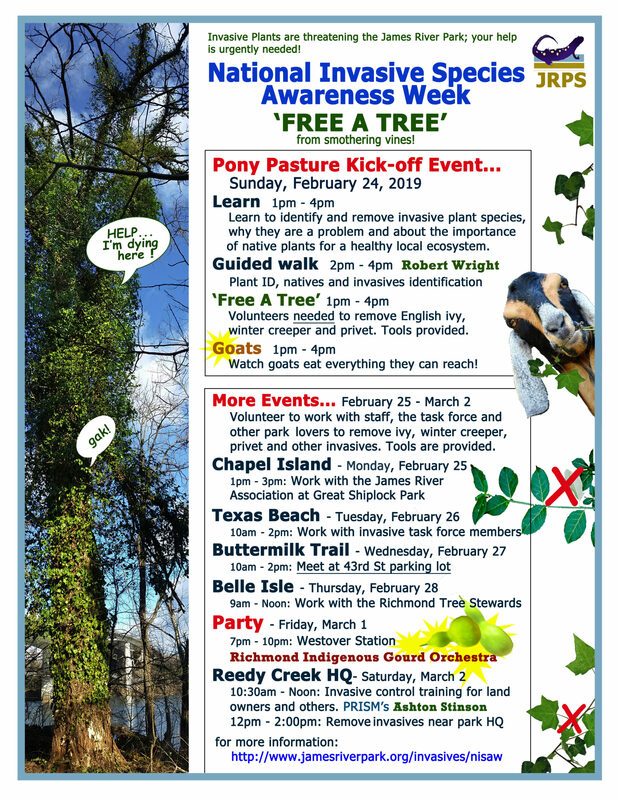 Join the Invasive Task Force for the kick-off event on Sunday, February 24 from 1-4pm. More details on the flyer below for all the FREE events happening the week of Feb 24-March 2.